I have a mild confession to share with you guys: I have been accused of being a hoarder. It’s true. I confess. Once, during a childhood move, my parents told me to make piles in my room of things I wanted to keep and things I wanted to give away. My dad came in to check on my progress and found almost everything in the Keep pile, and practically nothing in the Give Away pile. He looked at the overflowing Keep pile, and saw a large shoebox full of paper scraps balancing on top. Small scraps, big scraps, thick paper, thin paper—probably almost a pound of paper scraps collected in an orange Nike shoebox. When he picked it up, he found another shoebox underneath and opened it to find a collection of smaller boxes inside. Big boxes, small boxes, old white jewelry boxes, little boxes inside other boxes. He ended up caving and we compromised to let me keep the scrap paper box, but get rid of the box of boxes. I hung on to those scraps of paper through 3 more moves and eventually used them to make books in my college studio courses eight years later. Fast-forward to now, where I collect books (to the dismay of my husband when we move and 75% of my boxes are full of very heavy books), pens, the names of restaurants I want to go to, the names of restaurants I have been to, recipes I have cooked, quotes I like, and essays that resonate deeply. I’m sure you’ve heard the phrase, “you are what you eat” a bunch of times. The phrase was first written by Anthelme Brillat-Savarin, a French gastronome (uh, hello new dream career!) 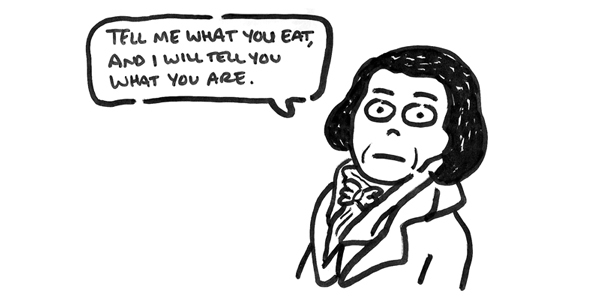 in 1826, and directly translates to “tell me what you eat and I will tell you what you are.” He goes on to talk about the link between the food you eat and your physical and mental health. Basically you are everything around you. You are what you consume. What we consume has a strong influence over what we think and who we are. Books, TV, movies, essays, social media, food—all these things go straight into our head and contribute directly to our evolving thoughts, beliefs, and ideas. The same is true for our art. Our art is going to reflect and be influenced by the stuff we choose to consume. But as artists, we have to not just consume things, we also need to collect things. The things we choose to notice and collect will spark ideas and give rise to our art. We artists are extra susceptible to being influenced by our surroundings. The things around us WILL seep into our work, whether we realize it or not. So it’s helpful to be aware of what we surround ourselves with. We also need to be aware of what we hold on to, of what we collect. These collections—artwork that spoke to us, movies that moved us, books that changed us, scrap paper we couldn’t let go—can be filed away so we can revisit them on a day when we need an extra spark. Collect the things that reach out to you, even if you don’t understand why—but remember to “collect selectively”. As Jim says, collect only the things “that speak directly to your soul”. Even if that means a scrap piece of paper. ​What about you? Do you collect things like this too? (Paper, pictures of cats, quotes…?) How do you organize them? (Shoeboxes under the bed, Evernote…?) Do you use them in your art? Yes, I am a “collector” as well. And recently, I really look for things from an artistic point of view. I work in a mailroom. So I get TONS of artist ideas on a daily basis. If something comes across my desk that I just can’t live without, I found a way use modern technology to keep it for awhile. I sneak by the office copier & color scan a copy to myself, then email it back home ;-). No paper wasted & I have an exact copy of the image I want to remember later. Sometimes I’ll crop it down to exactly what I wanted. It’s worked so far. Now just to catch up with all my ideas!! 🙂 Thanks Again, Christine!